This is the inCASA poster, produced by NTUA, which aims at providing a quick overview of the inCASA approach and of the inCASA service goals. An article about Domomedicine and the inCASA project was published on the widely known French national newspaper "Le Figaro" on February 23th, 2013. 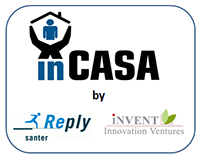 Flyer describing the transferability demonstration of the inCASA solution that will be carried out in the Danish municipality of Skive. In Danish.